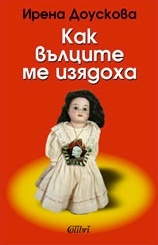 This book of Irena Dousková contains the novel “How the Wolves Ate Me” and the collection of stories under the title “The Pervert”. The novel “How the Wolves Ate Me” has been remarkably well received by readers and has gone through several editions, even was released on CD. Also it has been adapted for the stage and the production has become a hit. “How the Wolves Ate Me” recreates the life in totalitarian society through the eyes of one child. The main character of the novel is writing in her diary everything that happens to her in school, when she is with her relatives or in the theatre where her parents are working. The fascination of the story is just in the naive child's look at the events. The collection of stories “The Pervert” depicts “small” human tragedies from the time after 1989. The tragic and grotesque experiences of the characters reveal the sad truth that often the reasons of our personal disappointments and downfalls were not caused by imperfection of the world, politics, society, but by our own imperfection and the restrictions which we impose to ourselves. Irena Dousková (1964) is a Czech novelist, short-story writer, poet and playwright. She has worked as a journalist and as an editor in various periodicals. Her style is readable, full of humour and ironic. In her stories Dousková describes human fates and relationships set in both past and present, she is a distinctive author who has mastered the art of observation and description of human characters. Irena Dousková's works have been published in Germany, Bulgaria, Hungary, Poland and Slovenia.